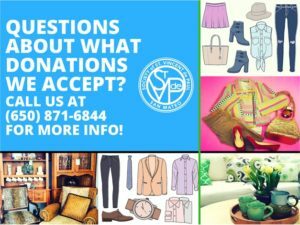 SVdP appreciates anything you donate, such as furniture, clothes, appliances, and refrigerators. The donated items need not be in perfect condition, however they should not need any repair or have any stains. Accepted items include clothing, shoes, accessories, household goods and furniture. They also re-cycle computers and electronics. Mattresses are not accepted. Bay Area Furniture Bank Whether you are looking for furniture or would like to donate your lightly used furniture the Bay Area Furniture Bank is a great resource. For details on donating and obtaining furniture visit their website.